Ginger Chicken is a delightful Indo Chinese dish and favoured by Indians at large. My kids and guests greatly enjoy this Ginger Chicken and it goes well with Fried Rice and Pulav. The thick gravy is slightly sweet but spicy and so this fusion dish is a real gastronomic delight for all. 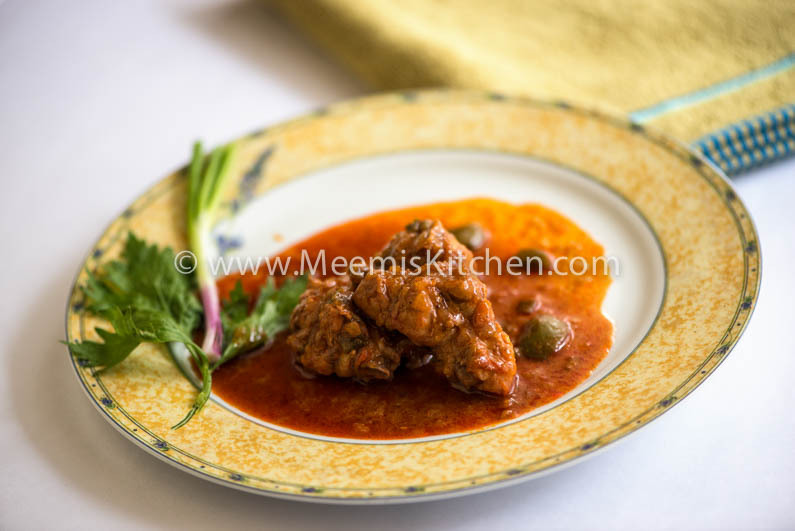 This easy chicken recipet was a much sought after dish from childhood and the aroma and flavours used to waft through the whole house. My kid’s friends would always come and ask me what I am cooking as the aroma is so irresistible. All chinese dishes or rather Indo chinese dishes are popular at home and my family relishes Chicken Noodles, Soups, Szechuan Chilli Chicken, Spring Rolls, chili Fish, Gobi Manchurian, Chili Paneer, chili Pork, Soya Manchurian, Honey Chilli Chicken etc. Although this saucy Ginger chicken has Chinese flavors, it goes well with most of the Indian rice like Jeera rice, Ghee rice and Vegetable Pulao. Like Punjabi Chicken curry or Kadai Chicken or Pepper chicken, this Ginger Chicken is a great dinner option for get together and parties. Celery provides wonderful Chinese flavours to Ginger Chicken, so, there is no need to add MSG. You also get dried Celery Salt in Super markets, something you can use if you don’t have celery stalk in your fridge. But use very little, with care, as it is too strong in flavour. I have added some red food color to the chicken pieces to make it more appealing. You can do away with it if your kids are allergic to food color. Some recipes call for frying Chicken pieces with a cornflour coating, like in most Indo- chinese recipes; I have avoided that extra oil in this recipe. Trying to adapt a healthier yet tastier style of cooking, if not always! Ha.. Ha. I have to confess, there are times when I refuse to listen to that irksome voice in my head trying to make me feel guilty of over indulging. Well, in this recipe, you actually don’t have to fry the chicken, it tastes delicious, just like that! 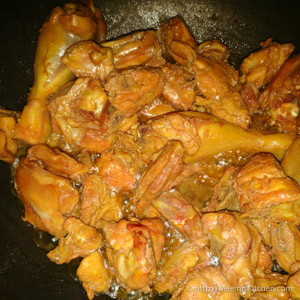 So, I know what you are planning for dinner today; ready to cook Spicy Ginger Chicken with me?? Green Chilly : 3-4 nos. Clean the chicken and drain all water. 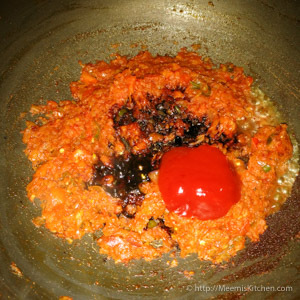 Mix with some salt, red color (optional) and 1 tbsp Soya sauce. Marinate for some time. Heat little oil (1 tbsp) in a kadai (non-stick is better) and add the chicken pieces and stir till the colour changes and water starts oozing out. Transfer it to another vessel, along with water. 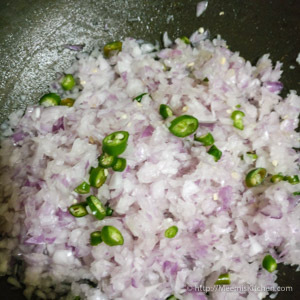 In the same pan, sauté finely chopped onion, green chillies cut into rounds till the raw smell goes. Add the ginger garlic paste and sauté well. 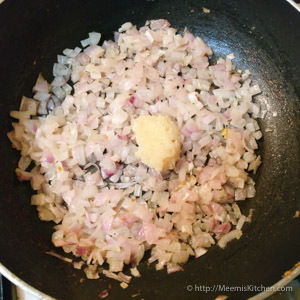 Once the onion becomes slightly brown, add red chilly powder and pepper and sauté. 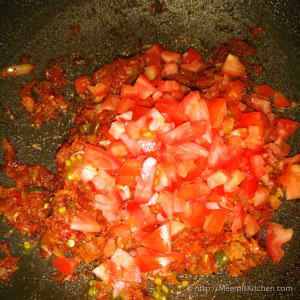 Chop the tomatoes finely and add to the gravy and stir fry till it is completely mashed and mixed. Add 2 tbsp Soya sauce and all other sauces and vinegar. Add 1 glass water and salt. Add the Chicken pieces and cook on low flame. 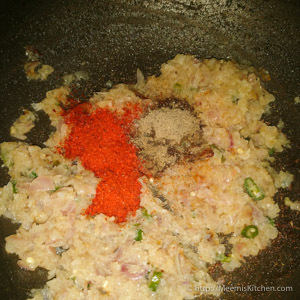 When it is almost cooked, add the cubed capsicum and cover and cook for another minute. Lastly add Spring Onion and Celery and transfer to serving plate. Garnish with Julienned Ginger and serve. 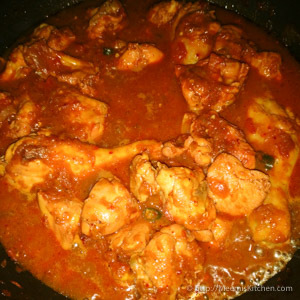 Enjoy this delicious and spicy Ginger Chicken with fried rice/ Pulav or roti. No need to add Sugar as the tomato sauce is sweet. 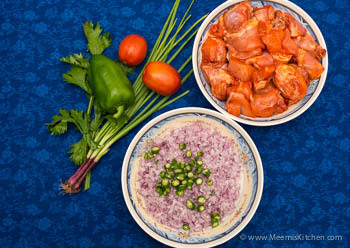 Adjust the ratio of sauces as per your taste as you might be using different brands. Dark Soy Sauce is used in this recipe. If you have a chopper, use it for chopping Onions. If you are using Celery Salt, use sparingly. Less than a pinch first and check the taste before putting more. Enjoy your dinner with Saucy Ginger Chicken and Fried Rice/ Veg. Pulav/ Roti and dry veg. salad. God Bless! !